Michael Dean (born 2 June 1968) is an English professional football referee who officiates primarily in the Premier League. He is based in Heswall, Wirral, and is a member of the Cheshire County Football Association. Since his appointment as a Select Group referee in 2000, Dean has officiated a number of notable matches, including the FA Community Shield and the finals of the FA Cup, Football League Cup and FA Trophy. Dean began refereeing in 1985. He progressed to officiate in the Northern Premier League as a referee, becoming a Football League assistant referee in 1995 and being promoted to the full referees' list in 1997. Dean was appointed to the Select Group of referees for the Premier League in 2000, being subsequently promoted to the FIFA international referees' list in 2003. Also in 2003, he was fourth official to Graham Barber at the FA Cup final held at Cardiff's Millennium Stadium, where Arsenal beat Southampton 1–0. Dean took control of the 2004 FA Community Shield match between Arsenal and Manchester United at the Millennium Stadium, a game which Arsenal won 3–1. He also refereed the FA Trophy final of that year. 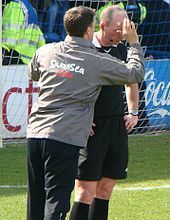 Dean was originally appointed to referee the 2006 FA Cup final at the Millennium Stadium on 13 May 2006 but the Football Association later replaced him with Alan Wiley after concerns were raised about Dean's ability to be impartial towards Liverpool, who are based near his hometown in Wirral. Dean made it to the Millennium Stadium eight days later though, when he refereed the Championship play-off final between Leeds United and Watford. Dean's highest refereeing honour came on 17 May 2008 when he took charge of that year's FA Cup final between Portsmouth and Cardiff City, with Trevor Massey and Martin Yerby as his assistants and Chris Foy as the fourth official. Dean issued three cautions during the match at Wembley Stadium, which was won 1–0 by Portsmouth. Dean receives treatment after being struck by a coin during a South Wales derby in 2009. On 5 April 2009 in a South Wales derby between Cardiff City and Swansea City, Dean suffered a cut to the forehead resulting from what appeared to be a coin thrown by a Cardiff supporter. He later awarded Cardiff a penalty kick, which was converted to earn a draw for the home side. Cardiff's chairman Peter Ridsdale condemned the attack and said that the supporter would be given a lifelong ban if found guilty. A 24-year-old man was later convicted over the incident and given a three-year ban and £200 fine. No action was taken by the Football Association of Wales against Cardiff City. In April 2010 Dean was appointed to officiate a fixture at Old Trafford between Manchester United and Chelsea. On 31 January 2011, Dean was appointed to referee the 2011 League Cup final between Arsenal and Birmingham City. Birmingham won the match 2–1, with an 89th-minute winning goal by Obafemi Martins. The Blues had taken the lead through Nikola Žigić, before Robin van Persie equallised for Arsenal. Dean issued five yellow cards during the course of the final. In September 2015, Arsenal supporters launched a petition to prevent Dean from refereeing their team following a Premier League fixture against Chelsea, gathering almost 100,000 signatures within a week. The Football Association later rescinded a red card Dean issued to Arsenal defender Gabriel during the incident, and handed Chelsea striker Diego Costa a retrospective three-match suspension for violent conduct. In January 2017, Dean was criticised after giving a straight red card to West Ham midfielder Sofiane Feghouli for a coming together with Manchester United defender Phil Jones, after which Jones writhed on the floor in apparent pain. The red card came after only 15 minutes and with the score at 0-0; Manchester United eventually won the game 2-0. Replays suggested that it was in fact Jones who had committed a dangerous challenge on Feghouli and was himself lucky not to have been sent off. Feghouli's red card was later rescinded. Dean first international match came in 2004 when he was appointed to a friendly between the Netherlands and Republic of Ireland at the Amsterdam Arena. The away side won 1–0 thanks to a Robbie Keane goal. On 30 September 2010, Dean refereed a Europa League group stage match between Borussia Dortmund and Sevilla. Early in the second half he showed a second yellow card to Dortmund player Marcel Schmelzer for diving. Dean has also officiated European Championship qualifying matches. His first appointment was to the Euro 2008 group F qualifier between Iceland and Latvia on 13 October 2007. The game in the Icelandic capital Reykjavík ended with a 4–2 win for the visitors. Dean's next European Championship match was on 12 October 2010 when he oversaw a group A qualifier for Euro 2012 between Belgium and Austria in Brussels. The away team appeared to have secured a 3–2 victory but two Belgium goals on 87 and 89 minutes overturned that scoreline, only for ten-man Austria to score an injury-time equaliser to earn a 4–4 draw. Dean stepped down from the FIFA international list at the end of 2013 at the mandatory retirement age of 45. On 2nd April 2019 during a game between Manchester United and Wolverhampton Wanderers, Dean gave the 100th red card of his career to Ashley Young. This makes Dean the first referee in Premier League history to do so. Dean brandishing a yellow card in a match between Manchester United and West Bromwich Albion in April 2017. Statistics are for all competitions. No records are available prior to 1997/98. ^ a b c Birthdate Archived 15 January 2008 at the Wayback Machine confirmation and biography: the Football League official website. Retrieved on 8 April 2008. ^ a b FA Cup Final 2008, plus other information: TheFA.com official website. Retrieved on 8 April 2008. ^ Community Shield 2004, Arsenal v. Man United: from The Independent website, via the FindArticles service. ^ FA replace Dean with Alan Wiley for the FA Cup Final, 2006: Daily Telegraph website. Retrieved on 8 April 2008. ^ "FAW starts coin-throwing inquiry". BBC News. 6 April 2009. ^ "Poll condemns FAW over coin row". BBC News. 19 May 2009. ^ "Arsenal 1–2 Birmingham". BBC News. 27 February 2011. ^ "Arsenal fans launch petition to ban Mike Dean from refereeing their games". The Telegraph. 21 September 2015. ^ "Arsenal fans' petition to ban Mike Dean from refereeing their games receives almost 100,000 signatures". The Daily Telegraph. 25 September 2015. Retrieved 31 December 2017. ^ "Chelsea striker Diego Costa handed three-match retrospective ban by the FA after clash with Arsenal's Laurent Koscielny". Daily Mail. 22 September 2015. ^ a b "Phil Jones' challenge on Sofiane Feghouli was more dangerous, says West Ham boss Slaven Bilic". Sky Sports. Retrieved 20 November 2017. ^ a b "Phil Jones should have been sent off, not Sofiane Feghouli, suggests Slaven Bilic". The Independent. 2 January 2017. Retrieved 20 November 2017. ^ Association, Press (4 January 2017). "West Ham's Sofiane Feghouli has red card against Manchester United rescinded". The Guardian. ISSN 0261-3077. Retrieved 20 November 2017. ^ Mention Archived 23 November 2006 at the Wayback Machine of his first International match, Holland v. Ireland, 2004: Newcastle-Online website. Retrieved on 8 April 2008. ^ Klopp: "Der Platzverweis ist absolut wahnsinnig" SPOX.com website. Retrieved on 1 October 2010. ^ "Mike Dean - Latest Football Betting Odds - Soccer Base". Wikimedia Commons has media related to Mike Dean.